Today, November 5, 2014, marks the 75th anniversary of the day my mother, Elfriede Fischer Höber, and my sister Susanne Höber, arrived safely in the United States from Nazi Germany. They had made a narrow escape weeks after World War II had begun. In the spring of 1939, Elfriede and Susanne, then age 9, had found themselves stranded in the north German city of Düsseldorf. My father, Johannes, had come to Philadelphia a few months earlier to prepare the way for them. In the intervening period, the Nazis continued to tighten the screws on the German population and threatened to plunge Europe into war. The pressure was getting extreme for the hundreds of thousands who wanted to leave the country. On June 22, Elfriede succeeded in getting a new passport for both her and Susanne. 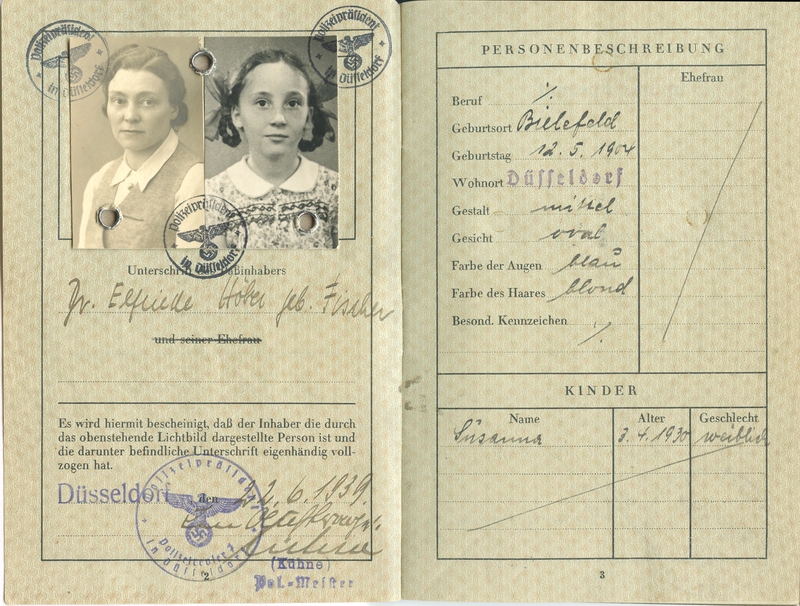 Passport issued by the German authorities for Elfriede Fischer Höber and Susanne Höber on June 22, 1939 . The greater difficulty, however, was to get a visa allowing them to enter the United States. American law at that time permitted only 27,000 Germans to obtain immigration visas annually. In 1938 alone, over 300,000 Germans applied for visas, meaning that hundreds of thousands of people desperate to leave the country were denied admission to the United States. Liberal legislative efforts to expand the number of German refugees allowed into the United States were stymied by a coalition of Southern congressmen, anti-immigration groups, isolationists and antisemites (since a majority of those seeking admission were Jews). The denial of entry to the U.S. doomed thousands who might otherwise have survived the Nazis. Elfriede and Susanne were among the lucky ones. After months of struggling with visa applications and mind-numbing paperwork both in Germany and the United States, they were summoned to the office of the U.S. Consul General in Stuttgart on July 12, 1939. The last step in the application process was a physical examination, which both of them fortunately passed. When the examination was done, a clerk used a rubber stamp to imprint two immigration visa approvals on a page of the passport, using quota numbers 608 and 609. 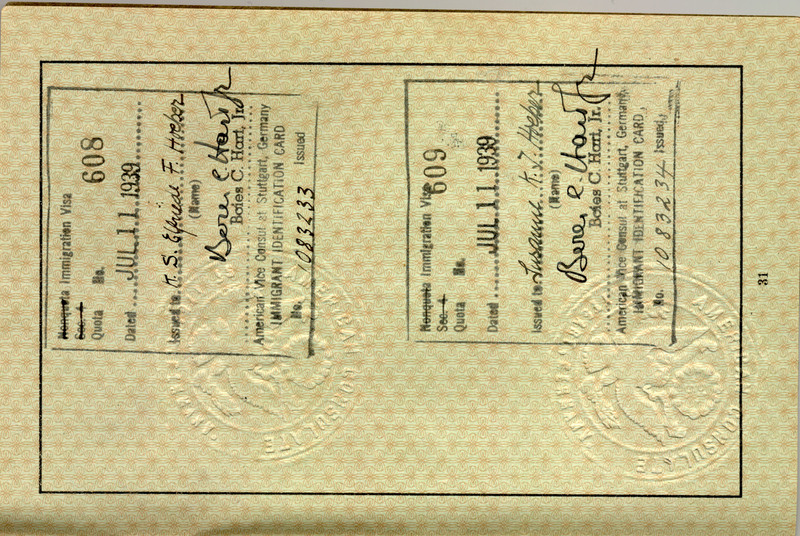 Vice Consul Boies C. Hart, Jr.’s signature and the embossed consular seal on each imprint made them official. Elfriede and Susanne now had had the wherewithal to escape to safety and freedom, a chance denied to countless others. Logistical issues made it impossible for Elfriede and Susanne to cross the German border into Belgium until September 19, by which time Germany had attacked Poland, and Britain and France declared war on Hitler. It took another six anxious weeks in Antwerp before they were finally able to board a ship for America. It is hard to imagine their joy and relief when they were reunited with Johannes on a pier in New York harbor on that day three-quarters of a century ago. The full story of Elfriede and Susanne’s escape is told in the book Against Time: Letters from Nazi Germany, 1938-1939 published by the American Philosophical Society. Click here to learn more about the book.